What I Say to The Vacuum Cleaner when I’m reading. This isn’t new information. Authors are passionate readers. Ask any writer what books influenced them as a kid and you’ve taken a step into the slippery abyss. Reading is the ultimate joy for me. 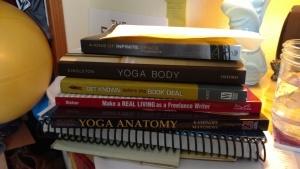 On a recent SUP yoga training, the paddle board expert asked what books I’d recommend. Between the librarian and me, the conversations spiraled into the night. It didn’t help he asked movies next, oy. A Little Reading for Work. Sure, I’m reading The Emotion Thesaurus, Get Known before the Book Deal (at the behest of my agent), and Yoga Body as part of my writing gig along with several others. I’ve specifically set time aside to read for the sheer joy of it. Harkens To My Love of Scooby Doo. I’m savoring each chapter the way I would nurse an everlasting gobstopper. Each layer brings me new delight. In between murder mysteries, more homework, I’m slowly moving through Gabriel Tallent’s My Absolute Darling. My tentative progress with this novel is twofold. As a survivor of sexual abuse, this novel presents like a sore tooth. You can’t stop fiddling with it. Tallent has drawn the complex relationship between abuser and victim in such a way that it’s nauseatingly real. The second fold that keeps me reading through the troubling bits is the lyrical and verdant writing. Tallent’s deft work fuels my self-doubt as a writer. I’m plagued by feelings I’ll never write as beautifully as he does.The other engaging layer to this novel in the characterization of two teenage boys who become friends with the protagonist. Tallent has channeled the goofball and endearing patter precisely, it’s like I’m eavesdropping on my gaggle of sons and their friends. I can’t help love these characters. I’m drawn into hope beyond hope they help redeem the main character. Stephen King said writers must read. How can I refute his advice? No matter how messy my house is or that I have fifty pages of a murder mystery due or a yoga platform to build. Pardon me, I’m going to read for an hour, maybe two.